Nice little work showing Ivan Tsarevich attempting to catch the firebird as the Humpbacked pony watches on. The earth tone colors combined with fine brush strokes of radiant gold give this one a subtle and classy look. 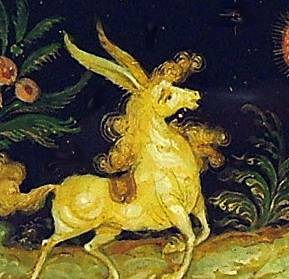 The image of the Humpbacked Pony is quite charming, too, big ears and all. It is framed with a simple gold dot ornament, and a more elaborate one adorns the side. 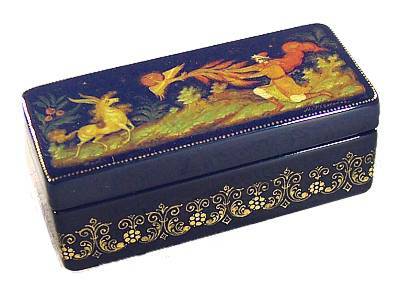 The box is made out of high quality papier mache and stands on four small round legs. It has a hinge and the interior is red. Signed with the name of the artist (M. Nebogatov) and the village. Looks better than the pictures of it here, where the fineness of the gold doesn't come come out too well.